Published on April 25, 2014 in Creativity, Fun Stuff, Motivation, Positive Thinking and Vision and Planning. 1 Comment Tags: 2 Words, Inspiration, Motivation, Two Words. 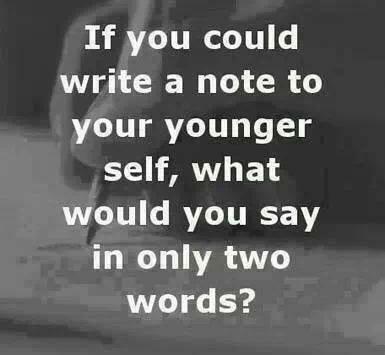 If you could write to your younger self, using only two words, what would they be? Respond by placing a comment below. Published on April 14, 2014 in Motivation, Positive Thinking and Vision and Planning. 0 Comments Tags: Acceptance Speech, Great Oscar Speech, Matthew McConaughey. Every once in a while you witness something special – at this year’s Oscars, Matthew McConaughey wowed me with his acceptance speech for Best Actor. It is well worth the 3 minute investment. Have someone to look up to. Have someone to be proud of you. Have a hero to aspire to become – YOU in 10 years from now… WOW! There are many life-defining moments, statements, incantations, words of wisdom and mantras. #3 for me is priceless and timeless – embracing the concepts of gratitude and excellence from within. That is an acceptance speech worthy of its own Oscar!